Self-closing pool gates are the most essential component of any pool fence system. To be really safe, they must be able to open and close correctly, always. Your swimming pool gate is supposed to undergo thousands of openings and closing, as well as withstand the elements. Life Saver Pool Fence’s pool safety gate is built using a double-truss system. A single-pole or single-truss system needs to be constantly adjusted. Combined with the fact that the gate and fence is removable, single-truss swimming pool gates are more likely to experience failure. A gate closing failure can render the whole pool fence unsafe because it allows access to the pool. The double-truss system of swimming pool gates allows for tension variations and minimizes the need for adjusting. Some pool gate manufacturers nonetheless still sell and install single-truss gates, despite their known problems. Other companies have added small changes like strengthening bars; still these gates are less reliable. Life Saver Pool Fence is the only manufacturer to offer a double-truss square-stock aluminum pool gate. While there are other manufacturers which produce double-truss gates, they use round pool fence poles. These weaker poles simply can’t compare to Life Saver’s double 1 ¼” heavy gauge, square-stock aluminum. Life Saver Pool Fence doesn’t sacrifice quality for strength or cost when making our gates. We use the most aluminum in fabrication to ensure proper functioning, solid, self-latching, self-closing gates for years and we support it with a lifetime warranty. Built on a double-truss system, the door of the gate is framed on all four sides by square stock aluminum also. The square stock and gate means that the hinges and lock are attached to flat surfaces, ensuring a proper fit. The gate is completed using 12/12 mill. Textilene mesh, bordered on all four sides and the bottom of its frame sits 1 ½” off the ground. We may be partial, be we think that we not only sell and install the strongest removable pool gates on the market, but also the most eye-catching. Since the self-closing pool gate is often the center of the fence, we figured why not create an attractive one? 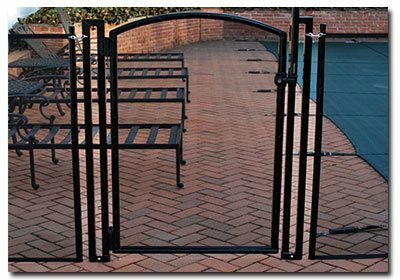 Our pool fence gates are available in a square model or in an arched model. 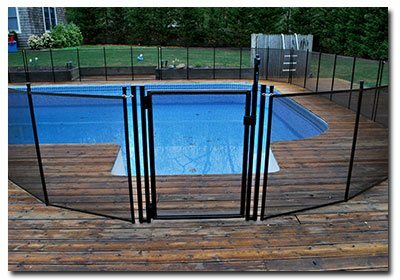 Custom mitered corners that are aluminum arc welded without the use of any unsightly weld plates makes our pool fence gates the strongest and most attractive pool gates in the industry. If you live on Long Island or reside in the New York area, please reach to us to talk about your pool safety needs. With a removable swimming pool gate installed by Life Saver New York, you can count on a professional installation of the highest quality and best looking gates in the market! Contact us today for quality self-latching and self-closing pool gate installations. Call (516) 766-5336 or contact us online.